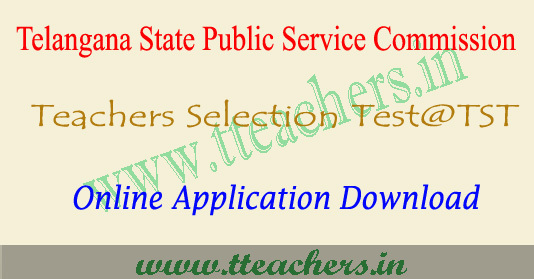 TSPSC TST Online application form 2017, ts tst apply online : Telangana TST application form 2017 is available to apply for Teachers Selection Test Exam 2017 for various (School Assistant & SGT). Application form of TSPSC TST Recruitment 2017 can be filled and submitted by eligible candidates. Telangana State Public Service Commission will consider applications of all such candidates who have entered correct data in form and submitted it before last date. Read instructions carefully and proceed to apply online for TSPSC TST 2017 to complete for 8792 vacancies in posts of SA and SGT in School Education Department. Candidates are advised to fill the tst online application form and submit it before the last date of the submission of the teachers selection test online application. Candidates who will submit their online application form on or before the last date will get the TSPSC TST hall ticket 2017 for the written examination. How to Apply to TSPSC TST 2017 ? Visit the TSPSC website www.tspsc.gov.in or just click on the direct link given below for TSPSC TST Online Application form 2017. Read the given instructions and TST eligibility criteria and other relevant information provided in the TSPSC TST notification. It is advisable to keep the details of you before you start filling the application form. Fill the application form and pay the registration and examination fee. Cross check the details and then submit the TS TST Application form. Take Printout of the form for the future reference.